Air compressors are one of the most important automotive service equipment which should take a space in your garage. 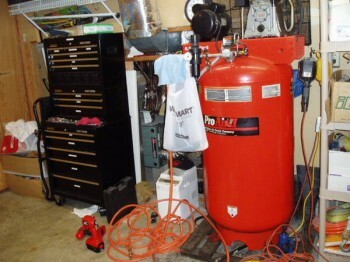 In this article, let us discuss how to find the right air compressor for your garage. If you have a simple home garage that doesn’t require a lot of high-demand air tool but needs something fast, easy and powerful enough to run a nailer, pump tires and spray paint, electric compressors are preferred. These are highly portable but do not have the same power of industrial versions. Commercial level air compressors are difficult to move around but comes with wheels similar to a trolley. Although they are difficult to move around they have enough power to do jobs without having to wait for the tank to fill. While there are single and dual stage model, in which the single stage versions are affordable and dual stage machines have lower RPM and better cooling which makes it cool and minimizes moisture that naturally builds up inside the tank. Industrial version air compressors are large in size and used to run a number of CNC based equipment and also requires less maintenance. They are costly too. The important thing to remember is air compressor should be chosen according to the magnitude of the job you plan to work on. Electric models require power outlet and are generally smaller, highly portable and essentially budget friendly. But gives a lower pressure than its counter parts. If you need more power you have to go for gas powered air compressors. Reciprocating air compressors use positive displacement to create pressure by using a piston and a cylinder to force the air at the other end. Rotary models are other form of automotive service equipment that also uses the positive displacement and often called as Spiral Lobe Oil Flooded Screw Air Compressor or Single Stage Helical which doesn’t have valves. They use rotors to compress the air inside a casing. Finally, Centrifugal models use dynamic displacement in which a rotating impeller creates energy by angular movement at high speeds to produce a continuous flow of high pressurized air. Hence they are ideal for large jobs. Brands warranty should be a primary factor when it comes to buying and also check whether the warranty covers all the parts and labor. Watch for what’s being offered by each company. Also check the working life of the equipment. Don’t forget to find a quality manufacturer by looking into the construction, number of cylinders used, as three cylinder versions work at maximum efficiency regardless of load variations. Look for arrangements that offer 360 degree cooling to the equipment. Check the equipment for lubricating options. Best automotive service equipment includes special W-3 construction for improved cooling and cast iron heavy-duty disc valves for best airflow, longer life, more horsepower and a minimum downtime. By simply doing the above little research on the features needed for your work, you’re sure to find a best piece of automotive service equipment that suits your job.